This is the second installment of the series "Getting Started With Hotel Points and Airline Miles. In general there are three types of credit cards that you should apply for. The first type of card that I routinely apply for is for the sign up bonus itself. The best of these types of cards will generally be offering a value of between $500-$1000 in sign up incentives. The incentives may be in the form of airline miles, hotel points, free hotel nights, or cash to be used toward travel. This class of card is to be used until the minimum spend requirement is met. After you have met the minimum spend, you will hold that card until just before the annual fee is due. At that point you will either cancel the card, or trade the card for a no fee version with the same issuing bank. Maintaining the account can help your credit score as it increases the average length of your credit accounts. There are many cards out there that you can cancel, wait a specific period of time (6-18 months typically), then sign up again and get the bonus again! The next type of card I carry is strictly for the benefits that the card has to offer. These types of cards have benefits that range from elite status with an airline or hotel chain, airline lounge access, free or inexpensive companion passes, waived baggage fees or free hotel nights. Depending on the types of benefits, the annual fee on this type of card could range from $65 to $495. This type of card you will keep for the long term because of the status or benefits it provides you. You would not place any spending on this type card other than to meet a minimum spending requirement. The last category of credit cards are the ones that you keep for everyday spending. I generally carry three different cards in my wallet for everyday use. 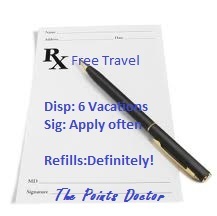 I have one card that I use for all restaurant and travel expenses (2X points), one for office supplies (5X points) and gas stations (2X points), and one for everything else not related to a specific hotel or airline expense. Now it is time for you to decide how you spend YOUR money and what bonus categories fit YOUR needs. In my dental practice, I spend a lot of money on advertising. I also have a card (not in my wallet) that pays 2X points on all advertising. Which airline cards you choose may be decided by the closest airport, or by which airline travels to the destinations that you frequent. I live in the Philadelphia area. We have access to all the major airlines. My wife and I both have a US Air and American Airlines card as part of our long term inventory. We frequently visit Aruba. US Air flies nonstop from Philadelphia to Oranjestad. We also like to visit the rest of the Caribbean. American usually has good award seat availability to most of the islands. Now that our youngest child is in his last year of college, we plan on traveling extensively throughout Europe. We recently signed up for a British Airways card that offered up to a 100K miles bonus as well as a free companion ticket. The companion ticket is good for the same class of ticket that you purchase. In other words, that ticket is good even if you purchase a First Class ticket with miles! Now that is what I call leveraging your sign up bonus! Two free First Class tickets to Europe for meeting a minimum spending requirement. However, it is a $30,000 spend requirement to get the companion ticket and the 100K bonus. At any one time, my wife and I may each have between eight and twelve credit card accounts open. Next time we'll discuss the 10 Best Credit Cards to own right now.